AFR GIVES BACK – AGAIN! We are pleased to report that 2018 was another successful year for Team AFR and our AFR Gives Back initiative. For the second year in a row, we teamed up to help fight hunger in 14 different cities across the United States. From coast to coast, we donated food and resources to make a positive impact on those struggling within our own cities. We volunteered our time and lent a helping hand to great organizations that deserve the additional support – particularly around the holiday season. We raised awareness and highlighted the importance of breast cancer education and research. And finally, as we tend to do each year, sometimes we gave back just because. Giving has never been an obligation for us. At AFR, we give back because it’s what we do. October is recognized internationally as Breast Cancer Awareness Month. 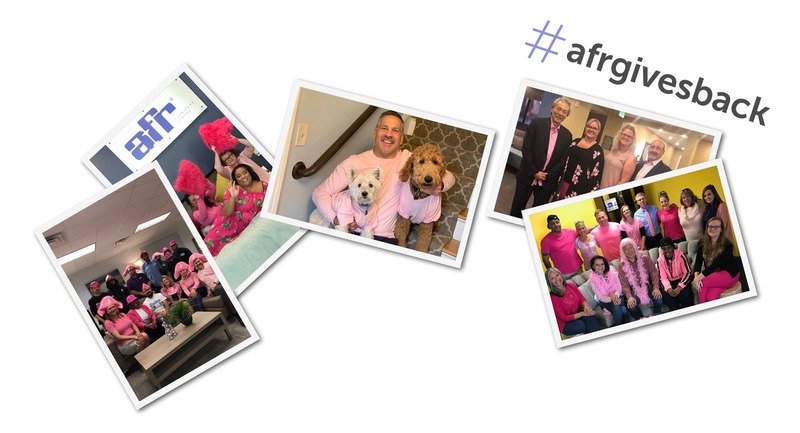 To support, AFR locations took turns wearing pink to raise awareness. According to the Centers for Disease Control and Prevention, breast cancer is the most common cancer in women in the United States. Regular screenings can help prevent the disease or detect it early on. Food insecurity affects millions living in the United States. That’s why AFR Gives Back has decided to make this our focus for the last two years in a row. Our regions identified urgent needs within their communities and worked hard to create a positive difference for others, taking a bite out of hunger where we live, work, and play – across the nation. To learn more about our AFR Gives Back initiatives and to find out about how you can get involved, check out our AFR Gives Back page.